Tony D Sound | Tony De Falco - Ahh..What do I know? Looking for a Rochester DJ who knows how to keep your party upbeat and your guests on the dance floor? Look no further… My name is Tony D and I have over 25 years experience, so I know what it takes to pace your party, reception, or event, and I’ll keep your guests happy ’til it’s time to go home! Unfortunately, those big services often charge thousands of dollars, if you can book them at all. On the other hand, I understand the music mix better than most, I actually prefer small and medium sized functions and venues, and you’ll find my pricing surprisingly reasonable. Not only that but – unlike some DJ’s out there – I don’t get stage fright or microphone jitters, so when you need something announced I can handle it smoothly for you. Even more important, I won’t take over the party the way some do. I’ll announce what you need announced, introduce who you need introduced, and smoothly step aside to let the spotlight shine on the person or couple it’s supposed to shine on. Have a special request, or just need me to play a little longer? Just ask… most likely I’ll be able to handle your request without a lot of fuss. My music collection includes literally tens of thousands of songs, and if I don’t have something, I can often download it instantly. Want Karaoke? We’ve got it! Tony D will also perform for your listening pleasure. Get ready for some Elvis, Frank Sinatra, Engelbert Humperdinck and even some Garth Brooks. Sing alone or in a group. The important thing is we have fun! We have a varied blend of equipment utilizing some things new and some tried-and-tested, including a state-of-the-art laptop, USB mixer, and double-deck CD player. My standard setup includes moving dance lights to make your guests feel like they’re on the floor at one of New York’s hottest clubs. If you’re looking for a Rochester DJ who understands exactly what you’re looking for – and knows how to give you professional, quality service – be sure to choose Tony D Sound. 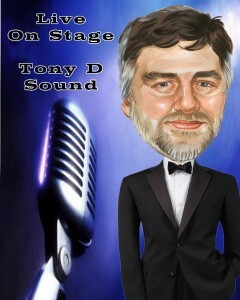 For more information, visit me at www.tonydsound.com!